June 2016: Blog – Air Quality and Economic Growth? March 2016: Blog – How do we Grow from Here? Learn more about a new initiative that aims to better prepare the Sacramento region’s small businesses in the face of extreme weather events. 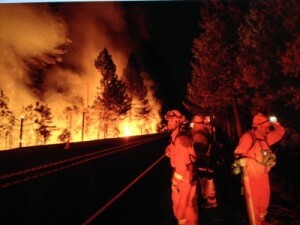 Natural disasters are increasing in frequency and severity. The Sacramento Region has experienced drought, wildfire, and risk of severe winter storms all within the constrained timeframe in 2014. Assuring our businesses are resilient through climate and weather-related events is essential to the region’s economy and wellbeing. You don’t want to miss this opportunity to gather with representatives from business, local government, health and environmental communities to hear more about this important topic. Larry Greene, Chair, Capital Region Climate Readiness Collaborative Steering Committee, will share why this topic is important to the Sacramento region’s air quality goals. Meg Arnold, Project Leader, Valley Vision, will present an overview of the Business Resiliency Initiative. Bobbin Mulvaney, Restaurateur, Mulvaney’s B&L Restaurant, will speak to actions they have taken as a small business to adjust to the impacts of extreme weather events. Malinda Matson, Economic Development Representative for Northern and Coastal California at US Department of Commerce, Economic Development Administration, will share key learnings with natural disasters throughout the nation. Reduce Energy, Save Money, Pollute Less Quarterly Luncheon speakers highlighted solutions to reduce energy consumption 11/26/2013 The final Cleaner Air Partnership luncheon for the year, sponsored by Pacific Gas and Electric, featured informative speakers and lively discussion regarding techniques to reduce energy consumption and their associated emissions. Jim Tischer, a program director for the Center for Irrigation Technology at California State University, Fresno, shared an overview of their research effort to improve water-pumping efficiency and the intersection with sustainable economics, air quality, transportation and growth. Moving and treating water accounts for 20% of California’s energy use, compared with 3-5% in other states, Jim said. Techniques to improve water conservation in farming, such as drip irrigation and more efficient pumps, not only reduces water costs, but it reduces the energy and associated emissions with transporting and treating water. PG&E has invested in the Drip Irrigation Pilot Program and other efforts through these water centers as they understand the critical importance of water conservation to support energy efficiency goals. Joe Liviach provided an overview of the Ygrene Clean Energy Yolo program. Clean Energy Yolo offers 100% Property Assessed Clean Energy (PACE) financing, with no upfront costs, for energy efficiency or renewable energy-producing improvements that are permanently affixed to the property. Drip irrigation systems, instantaneous hot-water heaters, and solar heating are among the 62 eligible improvements for residential and commercial property owners, reported Joe. Loans are paid in five, ten or 15 year periods via property taxes. In the 10 days Clean Energy Yolo program has been open, energy efficiency applications totaling over $3 million have been submitted. The meeting concluded with an update regarding the importance of access to broadband, or high-speed Internet, as a pollution-fighting strategy. Tara Thronson, Project Lead with the Connected Capital Area Broadband Consortium (CCABC), shared areas where a broadband connection can reduce carbon emissions, including soil moisture sensors that help farmers reduce water usage and the associated energy usage while increasing crop production, reduction in vehicle miles traveled through telecommuting and use of telemedicine, and implementation of the “smart grid” where through two-way communications the electric grid can better manage energy demand and the integration of renewable energy sources. “Studies estimate the Smart Grid can reduce greenhouse gas emissions from electricity generation by as much as 12% by 2030,” Tara said. “That is the equivalent of removing 65 million cars from the road.” The CCABC is working to increase digital access and use in Sacramento, Sutter, Yolo and Yuba Counties. 3. 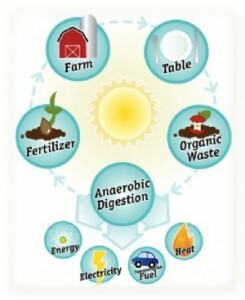 Sacramento has the most High Solid Anaerobic Digestion capacity of any community in the United States When asked “why Sacramento” Shawn advised it was due to the supportive partners such as the city, county, air district, utilities, CalRecycle and local businesses. “In some cases our permitting took only two to three months,” Shawn remarked,” where in other locations in the nation the same permitting process can take up to two years.” Meeting attendees also heard from Dr. Val Tiangco, Biomass Program Lead for SMUD’s Energy Research & Development Department. He provided an update on SMUD’s aggressive renewable energy goals that they seek to meet in an affordable, reliable, and sustainable way. Dr. Tiangco reported that the company is on track to become the first California utility to receive 20 percent of its energy from renewable resources, 61 percent of which is sourced from biomass. Local Program Improves Housing Stock and Air Quality Small investment reaps large returns 6/25/2013 Seeking a proactive and voluntary program to help reduce greenhouse gas emissions from homes, the Sacramento Association of REALTORSÂ®, in partnership with the Sacramento Metropolitan Air Quality District, Rebuilding Together Sacramento, Habitat for Humanity, and UC Davis developed the Home Energy Conservation Program (HECP). Through the HECP volunteers improves energy efficiency for low-income homeowners in the Sacramento region by providing the most cost-effective weatherization upgrades, such as window caulking, door weather stripping, installing electrical gaskets, replacing standard light bulbs with compact fluorescent, wrapping hot water heaters, insulating hot water pipes, and installing low flow showerheads. Over 75 homes have been upgraded in the past year, averaging less than $200 in costs per home, offering annual utility bill savings of $360, and reducing greenhouse gas emissions by approximately one ton per year. U.C. Davis has leveraged technology applications to improve this program, such as developing a smart phone app for data collection, mapping pockets of low-income seniors in the region for program recruitment, and modeling greenhouse gas emission reductions. Long-term HECP would like to create a protocol allowing local investment from businesses purchasing carbon credit offsets. Tax-deductible contributions to this program can be made at http://www.sarcharitablefoundation.org/donate/ with the entry “Home Energy Conservation Program” in the description field. CAP Says Don’t Raid Cap-and-Trade Auction Proceeds to make State Budget Balance CAP urges use of Cap-and-Trade proceeds for greenhouse gas reduction efforts 6/25/2013 Before the California state budget deal was completed, the leaders from the business, public health and environmental organizations that constitute the Cleaner Air Partnership quickly reached a consensus decision: using Cap-and-Trade auction proceeds to temporarily make the state budget balance was poor public policy. 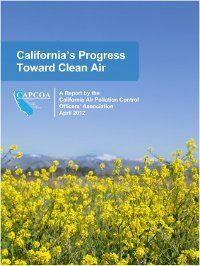 The California Air Resources Board developed the Cap-and-Trade program to reduce emissions and support meeting the goals established in AB 32, the Global Warming Solutions Act of 2006. Since its adoption seven years ago, the public record is replete with statements that revenues generated from credits would be re-invested in activities that accelerate greenhouse gas reduction efforts in the private and public sector. The Cleaner Air Partnership believes that borrowing Cap-and-Trade revenues for temporary general fund relief sets a bad precedent, erodes public trust in state government’s ability to keep its prior commitments, and lengthens the time and diminishes the resources available to reduce greenhouse gas emissions in a timely fashion. “When these organizations are of common view and purpose, as they are on this matter, it signals to policy makers an issue deserving significant attention and care,” said Art Pimentel, Chair of the Cleaner Air Partnership. 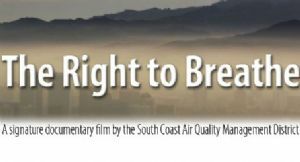 The Cleaner Air Partnership sent a letter urging lawmakers and the Governor to reverse the use of Cap-and-Trade proceeds for general fund relief as soon as possible. Although the budget has passed, the partnership will continue to advocate that this decision to be reversed as soon as possible. 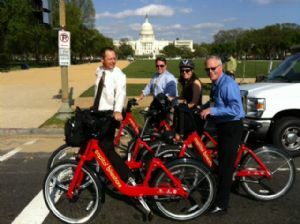 Additionally, the team had very informative meetings with Washington D.C.’s Capital Bikeshare program director and Alta Bikeshare (operator of the system) about the nation’s largest and most successful bike-share program. Capital Bikeshare allows a rider to “borrow” bikes from convenient kiosks and return them to stations throughout the city. They provided helpful information about their financial model, metrics tracked, and their advice for launching a new program. 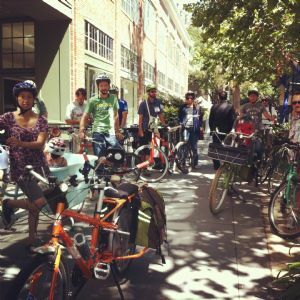 Many Cap-to-Cap delegates utilized the Capital Bikeshare system, and considered what bike share could look like in the Sacramento region. Fehr & Peers has been retained by the Sacramento Metropolitan Air Quality Management District to conduct a business plan for a regional bike share system which will include recommended sites for bike share stations and an estimate of initial capital costs and ongoing operational expenses. 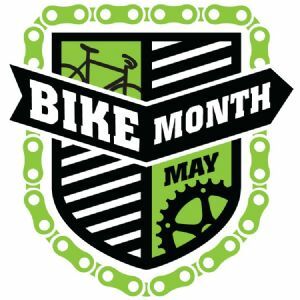 Contact Chris Morfas at cmorfas@airquality.org for more information about the bike share effort in the Sacramento region. CAP Business Partner Recognized for Environmental Excellence Union Pacific’s Lanny Schmid receives high honor 11/30/2012 The Association of American Railroads (AAR) awarded the 2012 Professional Environmental Excellence Award, the highest honor for environmental professionals in the railroad industry, to Union Pacific (UP) Director of Environmental Affairs Lanny Schmid. Based in Omaha, Neb., Lanny, a 27-year veteran of the railroad industry, works tirelessly to identify environmental trends and initiatives to bring about optimal solutions for both his company and the communities through which it operates. “Railroads have a great environmental story to tell from a fuel efficiency and emissions reduction standpoint,” said AAR President and CEO Edward R. Hamberger. “But it is employees like Lanny who are dedicated to both their company and to the preservation of our natural environment that are the rail industry’s ultimate environmental advantage.” During his 27-year UP career, Lanny has worked to bring together federal and state agencies, communities and key personnel from various railroad departments to find workable solutions to environmental issues. 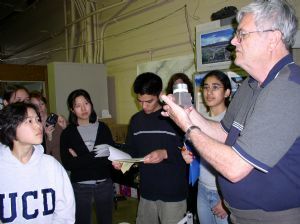 An example is his work with the California Air Resources Board since the mid-1990s to bring the most advanced and environmentally friendly technology to the state’s South Coast Air Basin before it was commercially available, leading to a 65 percent reduction in nitrogen oxide (NOx) emissions, AAR officials said. In addition, he led a program to explore experimental testing of exhaust gas recirculation systems to reduce NOx emissions and was instrumental in obtaining grants to replace 166 older locomotives with newer ones that can reduce emissions. 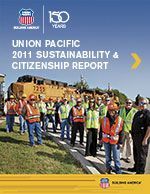 Union Pacific is one of the Cleaner Air Partnership’s funding partners and is committed to reducing emissions for the benefit of air quality in the Sacramento region. Art Pimentel steps in as new chair of Cleaner Air Partnership Former Woodland mayor to assume volunteer position following Tom Stallard’s seven year leadership 11/30/2012 The Cleaner Air Partnership (CAP) is pleased to announce that former Woodland Mayor Art Pimentel will serve as the next Chair of the Cleaner Air Partnership. Art has skillfully represented the region’s air quality initiatives on the annual Capitol-to-Capitol lobbying trip to Washington DC. Pimentel also previously served as the chair of the Yolo-Solano Air Quality Management District (AQMD) Board of Directors, where he led a coalition of elected officials from the Yolo and Solano counties to adopt rules to protect both the public health and the communities’ largely agricultural economies. With more than 13 years of experience in community-based organizations, Pimentel is an accomplished professional in public policy, building coalitions, and leading community-based efforts that seek economic, environmental and public health benefits for all people. “Art is dedicated to helping communities and businesses work together to improve our air quality in ways that benefit everyone,” said Mat Ehrhardt, Executive Director of Yolo-Solano Air Quality Management District. “As chair of the Yolo-Solano AQMD, Art showed a deep commitment to meeting air quality goals through collaboration and creative thinking.” Members of the Cleaner Air Partnership highly regard outgoing Chair Tom Stallard for his leadership and regional consensus building and are grateful for the seven years he’s dedicated to the Cleaner Air Partnership as volunteer Chair. “The news that Art Pimentel will be the next chair of the Cleaner Air Partnership is most welcome,” said Stallard. “Art has chaired the Yolo Solano Air Quality Management District Board of Directors and has a passion for the quality of our air. He is a skillful and intelligent thought leader who attracts others to issues that concern him. CAP is in good hands with our talented staff at Valley Vision and with Art Pimentel as the volunteer chair.” Art is currently the Director of TRiO Programs at Woodland Community College and serves on the Woodland Healthcare Community Board of Directors and the Woodland Youth Coalition. 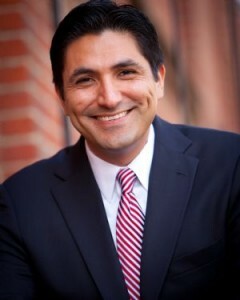 Art will begin his role as Chair of the Cleaner Air Partnership on January 1, 2013. Rail Project to Provide Jobs and Produce Biomass Diesel A New Track and Renewable Fuels Facility Planned at the Port of West Sacramento 6/20/2012 In June, 2012 the Port of West Sacramento closed escrow on the transfer of almost 19 acres of land from the Port to Woodland-based Sierra Northern Railroad, allowing for the development of a new rail loop track. The new loop track will be constructed using funding from the Federal Railroad Administration’s Rail Line Relocation and Improvement grant program. The rail project is expected to create 10 temporary construction jobs and position the Port to compete more effectively for new export cargo. “This new loop track is a huge advance for the Port. 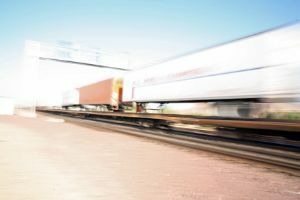 We’ll be able to unload rail cars more quickly and efficiently, and reduce rail impacts in West Sacramento,” said Mike McGowan, Port Commission Chairman and Yolo County Supervisor. “The new loop track not only increases commerce to West Sacramento and the Port, but it also contributes towards the long term development plans for downtown West Sacramento,” said Dave Magaw, President of Sierra Northern. A renewable fuels facility is also being developed on the site. Recently approved for a $5 million California Energy Commission grant, the SacPort BioFuels facility endeavors to show how locally generated, non-recyclable waste can be converted into locally made, locally used renewable fuels. Officials project that the fuels facility will produce 365,000 gallons of renewable diesel that will be blended with conventional diesel. At full capacity, the project is expected to create more than 60 permanent jobs and more than 100 additional temporary construction jobs. “West Sacramento continues to add sustainable businesses to the City and Port. SacPort BioFuels is a great addition to the list of companies investing hundreds of millions of dollars in West Sacramento, creating needed jobs and promoting commerce at our Port,” said West Sacramento Mayor Christopher Cabaldon. 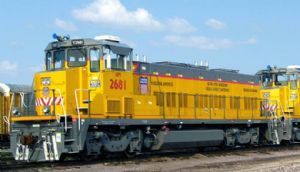 The Placer County Air Pollution Control District has implemented self-sustaining forest management activities to restore forested land and has successfully engaged with the Union Pacific Railroad Company to reduce locomotive emissions from the rail yard. The Sacramento Metropolitan Air Quality Management District (SMAQMD) has attained the Federal PM 2.5 standard through its Check Before You Burn advertising and outreach efforts and Spare the Air Days. The District funded the upgrading of hundreds of on-road heavy-duty trucks, school buses, and agricultural equipment. The Yolo/Solano AQMD has replaced 16 school buses and has installed diesel particulate filter retrofits on 63 buses through the District’s Clean School Bus Program. The District also maintains a robust public outreach program using its “Enviroflash” service, which provides daily air quality information via email or text message. Broadband as a Green Strategy New Research Study Shows Connection Between Digital Access and Reducing Pollution 4/20/2012 Valley Vision has released a new study that shows how best practices of digital applications help reduce pollution and improve transportation, health, and energy. The policy brief entitled Broadband as a Green Strategy: Promising Best Practices to Achieve Positive Environmental and Economic Benefits Through Accelerated Broadband Deployment and Adoption focuses on areas identified as the best immediate opportunity for high-level impact and help meet air quality standards. The California Emerging Technology Fund (CETF) contracted with Valley Vision to identify ways that remote health care, telework, digital learning, Smart Grid (two-way flow of electricity and information) and other applications offer “green” benefits to the environment. Reducing the amount of vehicle miles driven or minimizing land use and real estate space requirements through digital infrastructure has the potential to reduce greenhouse gas emissions and lower costs. The policy brief provides a concise checklist of the recommended best practices in the areas of transportation, health, and energy to help achieve sustainability goals. For more information and to download the policy brief Broadband as a Green Strategy: Promising Best Practices to Achieve Positive Environmental and Economic Benefits Through Accelerated Broadband Deployment and Adoption and the literature review please visit www.valleyvision.org. A survey conducted by the National Association of Realtors found that 56% of Americans want walkable and bikeable communities. In addition to Generation “X” and “Y”, more of the Baby Boomer generation is seeking these active transportation options. Risk for negative health impacts associated with particulate matter (PM) is increased for residents living within four blocks of freeways. Infill projects need to be developed with safety and health in mind. A simple buffer zone is not an effective solution, but six prevention strategies were proposed to reduce health concerns. Speaker Dan Burton spoke of the La Jolla Boulevard renovation, which included lane reduction, angled parking, transitional lanes, a landscaped median, and roundabouts. These improvements greatly reduced congestion and the associated emissions and resulted in an increase in sales tax revenue of 30%. Draft Metropolitan Transportation Plan and Sustainable Communities Strategies Released MTP/SCS to focus on transportation and land use options 1/23/2012 The Sacramento Area Council of Governments (SACOG) recently released their Draft Metropolitan Transportation Plan/Sustainable Communities Strategy for 2035 (MTP/SCS) which is a regional plan for transportation investment priorities in the six-county region based on projections for growth in population, housing and jobs. The goal of the MTP/SCS is to make it possible for more people to live and work in the same community and live independently as they age. The MTP/SCS addresses the needs of the 2.3 million people currently living in the Sacramento Region by increasing maintenance of existing roads, adding more sidewalks and bike lanes, and focuses on restoring, maintaining, and expanding transit. The Draft MTP/SCS offers more transportation and land use options and makes the most of transportation funds despite funding cuts and regulatory restrictions. The plan improves upon past efforts to use funding wisely, reduce time spent in congestion, reduce greenhouse gas emissions, and increase the number of residents with access to transit. Air quality is an important part of the MTP/SCS due to the widespread consequences it has for public health, the environment and the economy. With a growing population, the region must rise to the challenge of meeting and maintaining state and federal health-based air quality standards. The MTP/SCS addresses air quality through a process called “transportation conformity” that coordinates with local plans for improving air quality. The local plans in our region provide the strategies that will be used to attain and maintain national air quality standards, and the conformity process determines that the land uses and transportation investments in the plan meet standards for ozone, carbon monoxide, and particulate matter. The strategies found within the Draft MTP/SCS focus on integrating transportation and land use and align with the objectives of the Cleaner Air Partnership. The Cleaner Air Partnership has found that air-friendly growth and maximization of efficient transit and road use will bring about a decrease in vehicle miles traveled, and consequently, an overall reduction in air quality implications. Better air quality helps improve public health and our region’s overall quality of life, which is important to the business community’s focus on improved workforce productivity and new business attraction and retention. The Cleaner Air Partnership submitted a letter of support to the SACOG Board of Directors with strong encouragement to continue to support smart growth strategies which improve air quality, and adopt the MTP/SCS by April 2012 to meet conformity requirements and avoid unnecessary risks to the region’s transportation funds. Clean Air Investors for 2012 The Cleaner Air Partnership Recognizes New Sponsors 1/23/2012 The Cleaner Air Partnership (CAP) is pleased to announce that the Port of West Sacramento, Union Pacific, and the Sacramento Association of REALTORSÂ® have joined CAP as 2012 funding partners. The Cleaner Air Partnership brings together business, local government, health and environmental communities to help the Capital Region meet clean air standards that protect health and promote economic growth. Close partnerships and working relationships with the business community are key components of our success. Operating since 1963, the Port of West Sacramento provides economic and environmental benefits to the region. The Port continues to serve the area by providing several thousand jobs to local residents and easy access for Northern California Farmers and strives to be one of the greenest Ports in the nation. Steps towards reaching this goal include installation of a 647 kilowatt solar system which covers virtually all of the Port’s operational electricity needs, a focus on recruiting green tenants such as wood-pellet, metals-recycling, biofuel and solar facilities, pursuit of a channel deepening project which will reduce air emissions and decrease congestion by removing more than 23,500 truck trips annually from Interstate 80, and installation of a mobile harbor crane that will be used for handling container and project cargo such as windmills and generators. “We look forward to engaging with the Cleaner Air Partnership for information sharing, dialogue and joint action with representatives from local government, business, health and environmental communities,” said Port Manager Mike Luken. 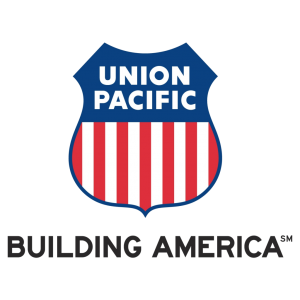 Celebrating its 150th anniversary this year, Union Pacific Railroad provides a fuel-efficient, environmentally responsible, and safe method of freight transportation. 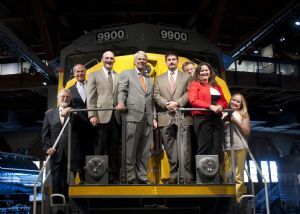 Since 2005, Union Pacific has used Genset switching locomotive technology, which has reduced oxide and nitrogen emissions by 80 percent, particulate matter by 90 percent, and greenhouse gas emissions by 37 percent. Union Pacific trains are four times more fuel efficient than trucks, and a single train can carry as much freight as 300 trucks. 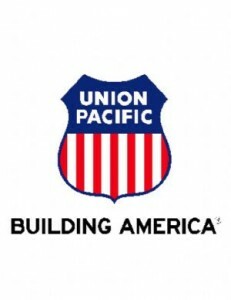 “Union Pacific Railroad is enthusiastic about our participation in the Cleaner Air Partnership (CAP),” said Liisa Stark, Public Affairs Director for Union Pacific. “The opportunity to share information related to UP’s ongoing local and system-wide efforts to reduce emissions, together with emissions reduction efforts by CAP partners, will lead to mutual benefits and beneficial discussions regarding improved air quality in the Sacramento region.” The Sacramento Association of REALTORSÂ® (SAR) is a professional trade organization serving over 6,000 Sacramento area REALTORSÂ® and Affiliate Members providing services and programs to help create more healthy communities. SAR has been a valued partner in educating residents in the region about the “Check Before You Burn” program, offers “ready to go” marketing to help members provide clients helpful tools to save money and protect the environment, and is currently working towards the creation of a comprehensive voluntary program to green existing homes and low-income housing. The Cleaner Air Partnership is grateful for the support of these organizations, and looks forward to working jointly to clean the air and promote economic growth in 2012. News from the COP-17 meeting in Durban, South Africa A briefing from the Global Climate Change Summit 1/23/2012 World leaders met earlier this month in Durban, South Africa for the 17th United Nations Climate Change Conference (COP-17) to seek advancement of actions to “stabilize greenhouse gas concentrations in the atmosphere at a level that will prevent dangerous human interference with the climate system.” In addition to the work of the official delegates, a parallel event at COP-17 provided an opportunity for information exchange, reporting and updating scientific information and coalition-building for organizations, businesses, scholarly endeavors and other conference participants. 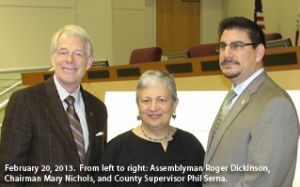 Larry Greene, Air Pollution Control Officer for the Sacramento Metropolitan Air Quality Management District participated in this event as part of a two-person team representing the National Association of Clean Air Agencies (NACAA). “Much of the rest of the world now understands that dealing with greenhouse gas emissions, energy use, water and air pollution all converge on sustainable communities and development,” stated Larry when asked about key lessons learned from his experience. “We are well on our way in California with SB 375 and AB 32 and especially in Sacramento with our work on Blueprint, alternative fuels, plug-in vehicles, solar, RUCS, and our Sustainable Communities Strategy.” In addition to attending various session regarding the state of emerging science and studies on the impact of global warming around the world, Larry also represented NACAA on the “Understanding the Real Impact of GHG Mitigation Activities” panel along with Mary Nichols (Chairman, California ARB), the Hon. Terry Lake (Minister of Environment, British Columbia), Linda Adams (President, Regions20), and Glenn Schmidt (Head of Steering Governmental Affairs, BMW). Overall outcomes from the COP-17 conference included an agreement from over 190 countries to draft a “protocol, legal instrument or an agreed outcome with legal force” aimed at reducing emissions by 2015, to be implemented by 2020. See the COP17 homepage for more information. Air Quality Leader Recognized for Excellence in Service Larry Greene Named Employee of the Year by SACOG 1/23/2012 On December 15, Larry Greene was presented with the SACOG Salutes! Employee of the Year Award. This award recognizes an individual employee of an organization or business who has made a significant contribution in the region in transportation, air quality, and/or smart growth. Larry has been the driving force in the many air-improving programs supported and implemented by the air district staff, including collaborative work to support local jurisdiction with toxic air contaminants, assessments of air quality impacts and benefits for infill and greenfield development, tools for residential developers to assess diesel fuel emissions, in addition to the more widely known Spare the Air and Check Before You Burn campaigns. Larry is a leader locally, nationally and internationally. 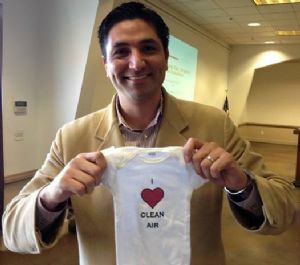 He is the Executive Director of the Sacramento Metropolitan Air Quality Management District. He and the District’s employees operate programs that reduce air pollution, encourage sustainable development, and impact public health. Larry has previously served as Air Pollution Control Officer for the Yolo-Solano Air Quality Management District, and has been active in the Cleaner Air Partnership, the American Lung Association, Breathe California of Sacramento-Emigrant Trails, The Sacramento Valley Basin Control Council Technical Advisory Committee, WALKSacramento, and the Sacramento Metropolitan Chamber of Commerce. 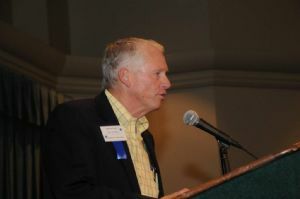 He currently is serving his second term as president of the California Air Pollution Control Officers Association. Earlier this month, Larry represented the region at the UN Framework Convention on Climate Change in Durban, South Africa. Growing a Better Community, One Tree at a Time Quarterly luncheon features speakers from local tree organizations 11/21/2011 The Cleaner Air Partnership Quarterly Luncheon, hosted on November 4th, featured speakers from area tree foundations discussing the benefits of urban forests. Cindy Blain of the Sacramento Tree Foundation provided an overview of the “Greenprint” program, which is a roadmap for mobilizing and empowering community partners and volunteers to plant 5 million trees in the Sacramento region by 2025 to create healthy and livable communities. While the benefits of trees include reduced air temperatures, increased shade, and reduced winter wind to curb energy use, Cindy advised “it’s not just about planting trees – it is about building a better community” by bringing volunteers together to plan, plant, and maintain the trees. As part of the region’s plan State Implementation Plan (SIP), which outlines measures to help meet the federal clean air requirements, the Sacramento Tree Foundation is working closely with the Sacramento Metropolitan Air Quality Management District to include trees as a voluntary control measure. This measure proposes to improve air quality by shifting 86,000 of the current 6.9 million tree inventory to tree species which emit fewer Biogenic Volatile Organic Compounds (BVOCs). In order for the U.S. EPA to approve the inclusion of tree plantings in the SIP, there needs to be demonstrated support from cities and counties in the region. The City of West Sacramento was the first to adopt an air quality and trees resolution where they committed to “increase the proportion of lower biogenic emitting tree species by up to 30%, where the tree planting does not conflict with native oak tree mitigation projects.” Dena Kirtley, Urban Forest Manager for the City of West Sacramento provided an overview of the City’s Free Shade Tree Program and commented that they joined as early adopters of Greenprint because they “believe regional participation and support of tree plantings are necessary to help meet Federal and State air standards to improve public health.” David Wilkinson from the Woodland Tree Foundation and David Robinson from Tree Davis emphasized the importance of collaboration, and in particular, their positive working relationships with their respective cities where they provide a valuable service with their ability to plant trees cost effectively using a volunteer workforce. In closing, Phil Tretheway, a participant in the 2011 Leadership Sacramento class encouraged attendees to join a tree planting event on Saturday, December 10th at 8:30am at Florin Road Bingo as part of their support of the Sacramento Tree Foundation’s “Cover Your Asphalt” parking lot retrofit program. After School Program Empowers Children to Clean the Air O24u begins second year of air quality education 9/27/2011 Breathe California of Sacramento-Emigrant Trails (BCSET) has successfully completed its first year of the new O24u program. O24u is an after-school program developed for children ages 8-14 years old. It educates students about the environment and its impacts on lung health. The program encourages participants to demonstrate responsible actions, through fun hands-on activities that empower children to make change for clean air in their homes and communities. During the 2010- 2011 school year BCSET implemented the O24u program in three elementary schools in Yolo and Solano counties, including Dixon, Davis and Woodland. Students learned the importance of mitigating air pollution by learning about the environment and practicing daily behavior changes, such as recycling, and taking public transit. A total of 14 site facilitators were trained to implement the program, and an estimated 500 students, and 1000 parents and community members were reached. Breathe California of Sacramento -Emigrant Trails has secured funding from the Yolo-Solano Air Quality Management District and the Mr. and Mrs. G. Kirk Swingle Foundation to place the program in additional schools in Yolo and Solano Counties, this year. Program curriculum, onsite training and supplies will be provided. BCSET is currently in the process of securing sites for the 2011-2012 school year and welcomes Elementary school programs in Yolo and Solano counties. If you know of a school or afterschool program interested in participating in this project, please contact Argelia Leon at aleon@sacbreathe.org. A small plurality of residents (27%) continue to name air pollution as the most important environmental issue facing the state, while far fewer mention other issues such as water pollution, water supply, energy or oil drilling, or gas prices. Just 4 percent name global warming. Los Angeles and Central Valley residents are more likely than residents elsewhere to say air pollution is a big problem in their region. About four in 10 residents say vehicle emissions are the top contributor to air pollution in their region. 1992 – Board of Directors adopts an Air Quality Attainment Plan for the District as required by the California Clean Air Act (CCAA) to improve air quality in Yolo County and northeastern Solano County. 1994 – AB 8 funds from Solano County are designated for the reduction of air pollution from motor vehicles and incorporated into the Clean Air Funds grant program. 2006 – Regional Spare the Air program expands to year round notification with PM 2.5 forecasts from November through March. 2008 – The District adopted Rule 11.3 which required a District registration for every agricultural use engine rated greater than 50 hp. To date, the District has registered more than 750 engines. Larry Greene Named Environmental Sustainability Leader of the Year Sacramento Air Pollution Control Officer honored at Valley Vision event 6/7/2011 Larry Greene, Executive Director for the Sacramento Metropolitan Air Quality Management District, received the Environmental Sustainability Leader of the Year award at Valley Vision’s Legacy Feast event on May 19, 2011. Each year Valley Vision honors three deserving leaders whose are making the Sacramento Region more prosperous, just, and sustainable. In addition to Larry, Meg Arnold of SARTA was honored as the Economic Leader of the Year and Scott Hanson of Hanson McClain received the Social Equity Leader of the Year award. The Regional Environmental Leader is given to an individual for significant positive environmental impacts in the Sacramento Region. “Larry is one of our region’s best public servants,” said Bill Mueller, CEO and Managing Partner of Valley Vision. “It is not only that he is deeply passionate about improving our region’s air quality and incredibly knowledgeable about technical and policy matters related to fighting pollution. It’s the fact that Larry doesn’t shy away from inventing new ways of doing things to achieve results. Larry is more than just an air quality manager — he is a leader in every sense of the word.” In addition to receiving a special award at a ceremony during Valley Vision’s Legacy Feast event at the California History Museum, each winner received a $3,000 cash grant to bestow to a nonprofit that is providing the next generation of leadership. Larry’s grant was awarded to WALKSacramento, a nonprofit community organization working to create walkable communities with communities of walkers throughout the Sacramento metropolitan region. Sacramento Region Air Advocate to Lead San Jose Silicon Valley Chamber Matt Mahood’s leadership contributed to CAP’s Success 6/7/2011 For 25 years the Cleaner Air Partnership has brought business and public-health interests together to find common ground when working to clean the Region’s air. While these groups do not always align, there have been many successes over the past nine years, in part due to the leadership of Matt Mahood, President and CEO of the Sacramento Metro Chamber. Matt will leave Sacramento at the end of this month to become the President and CEO of the San Jose Silicon Valley Chamber of Commerce. Matt understands the impact air quality has on the Region’s business community and actively engaged in conversations to address the Region’s challenges. “It says a lot when leaders in the region make the commitment to gather at 8am and discuss air quality and the associated complexities, especially when your calendar is as crowded as Matt Mahood’s,” said Tom Stallard, Chairman of the Cleaner Air Partnership. “But Matt was a regular with us, and this personal commitment on his part made a huge difference in what we have been able to accomplish for air quality in our region. The Cleaner Air Partnership is grateful for his contributions to our efforts.” Matt’s involvement in the advocacy efforts of the Cleaner Air Partnership made a big difference in helping the group achieve its public policy priorities. At the State level there is now an Air Quality team participating in the Metro Chamber’s State Legislative Summit, and at the Federal level the Cleaner Air Partnership leads the Air Quality Cap-to-Cap team to Washington, DC. Additionally, through Matt’s leadership the business community engaged in matters relating to improving air quality and brought funding support to the Cleaner Air Partnership. Martha Clark Lofgren, Partner at Brewer Lofgren LLP, will serve as the interim President and CEO of the Sacramento Metro Chamber until a permanent replacement is selected in early fall. Sought incentive-based approaches to change-out old wood-burning stoves, and more. Since 1996 the Sacramento Region has provided nearly $140 million in matching funds to support efforts to reduce pollution from mobile sources like big semi trucks and passenger cars – a significant investment when compared per capita to other metropolitan areas. While significant progress has been made to reduce smog and soot over two decades, the report found the region needs to do more to reduce the health impacts triggered by poor air quality. The rate of asthma hospitalizations has trended downward since 2001, but the report noted 2,233 hospitalizations in 2009 – a figure still too high. And long-term exposure to fine soot, smaller than 2.5 microns, has been shown to have a causal result in premature cardiopulmonary deaths, causing 640 premature deaths annually in the Sacramento Valley. Meetings in D.C. Yield Policy Wins, Critical Insights 5/12/2011 Reflecting on the 2011 five-day Capitol to Capitol Trip, hosted by the Sacramento Metro Chamber, the Executive Director of the Sacramento Regional Air Quality Management District Larry Greene, the Environmental Manager for Teichert Aggregates Becky Wood, and the CEO of Breathe California of Sacramento Emigrant Trails, Kori Titus, talked about what they accomplished and insights gained at this year’s event. Nearly 300 attended the event, and over 240 meetings were held in five days with the Congress, Senate, and Administration. The Air Quality Team was one of a dozen teams that advanced issues of concern to policy makers there. Here’s what they said: Q. Now in its 41st year, what made this year’s “Cap to Cap” trip different from the rest? Greene: On a negative side, the difficulties in D.C. with the budget and partisanship cast a shadow over every conversation. On a positive side, I think our Air Quality Team and process gets more effective each year and our positive attitude and success stories were welcome news in the context of Washington, D.C. today. Q. In your view, what was the major accomplishment in 2011 and why? Greene: Receiving the news about the 1-Hour attainment letter signed by the EPA Region IX Administrator on Monday moved us toward attaining that standard in a way that benefits our business community. (Click here to learn more.) On a less global note I think our meetings with EPA were excellent, and our work to ensure CMAQ (Congestion Mitigation Air Quality) funding remains in the Transportation program were important. Titus: Showcasing the innovative solutions we have pioneered in the region. We were able to show key decision makers that we can deliver on, and exceed, our promises. I believe that from these discussions Sacramento will be the first region thought of when new programs need to be tested and resources are made available. Q. Why does Cap to Cap matter to the Air District? How and why does it advance your interests? Greene: For each of the issue areas that are key to attaining our air quality standards, having the support of the Cap to Cap regional team enhances our ability to get attention, resources and resolution to issues. Cap to Cap gets us in doors that would otherwise be unavailable. Cap to Cap also provides the forum to find issue areas where we can enhance options that provide solutions to multiple regional issues. Q. What are the lessons you took away from Washington, D.C., this year? Wood: It is as important to listen some years as much as it is to talk and inform. We listened to the concerns voiced about the direction the country is headed and hopefully can come back with positions that work within the current funding constraints faced by the country. Q. What was the significance of this year’s trip, in your estimation? Titus: Cap to Cap was a chance to share the air quality successes of the Sacramento Region with our elected leaders and key departments. It was also an opportunity to showcase how we can leverage resources and work together to overcome the challenges we continue to face. Q. What’s next? Titus: We have to continue to work collectively in our region if we have any hope of achieving the challenging air quality goals we face. We need to continue to think out of the box, particularly as resources become scarce. And we have to fight to keep the funding we need flowing to the local level so that we can have healthy air for our children and grandchildren. Placer County APCD Recognized by U.S. EPA Innovative biomass project receives Clean Air Excellence Award 4/25/2011 Placer County’s Forest Resource Sustainability project has received the 2010 U.S. Environmental Protection Agency (EPA) Clean Air Excellence Award in the Community Action category. The Clean Air Excellence Awards Program annually recognizes and honors outstanding and innovative efforts to achieve cleaner air. The Community Action Award is bestowed upon a community public-private partnership that reduces pollutant emissions and engages a diverse group of stakeholders in efforts to improve air quality. Rather than burning the waste collected through efforts to reduce wildfire fuel hazards, the Forest Resource Sustainability project converts the woody biomass to renewable electricity. In the past four years the project has generated enough electricity to power more than 1,500 homes for one year, and achieved significant air pollution reductions. According to the EPA, this project stood out from the over 75 applications received for its impact, innovation and replicability. 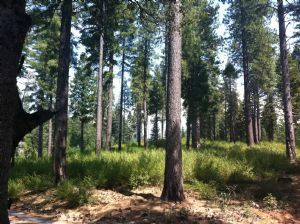 “We are pleased that EPA has recognized our efforts at reducing both air pollution and the risks of catastrophic wild fires through the harvest, processing, and conversion of excess forest biomass into renewable energy,” said Tom Christofk, Air Pollution Control Officer for the Placer County Air Pollution Control District (APCD). 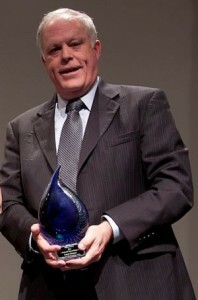 Tom Christofk will accept the award on behalf of the Placer County APCD at the 2011 Clean Air Excellence Awards Ceremony in Washington, D.C. on June 7, 2011. Woody Biomass Used as Fuel Reduces Air Pollution Publication quantifies air emission reductions of biomass disposal methods 2/16/2011 Air Quality leaders in Placer County recently authored an important research article entitled “Emission Reductions from Woody Biomass Waste for Energy as an Alternative to Open Burning” recently published in the Journal of the Air & Waste Management Association. The Journal is the oldest continuously published, peer reviewed, technical environmental journal in the world, featuring the latest in cutting-edge research and technology. Wood smoke is the largest source of particulate matter (PM) in Placer County. Particulate matter, or soot, has been found to cause lung irritation and aggravate asthma. The authors of this article sought to evaluate a solution which would remove woody biomass fuel hazards, reducing the severity of wildfires, in a manner that decreases particulate matter emissions. The article assesses the air quality impact of traditional open pile burning compared to an alternative fate – utilization of woody biomass material as fuel for renewable energy production. Based on the results of the demonstration, their study found that biomass converted to energy reduced PM emissions by 98% and nitrogen oxides (NOx) by 54%. Although processing and transporting biomass material to a renewable energy facility results in significant air quality benefits, to make this solution economically feasible the cost to process and transport the biomass must be reduced or emission reduction credits must be sold. “This case study confirms the significant net benefits accrued from diversion of woody biomass material away from business as usual pile and burn techniques when compared to the alternative fate of utilizing this material for the generation of renewable energy” noted Bruce Springsteen, the lead author of the article. Quarterly Luncheon focuses on Cap and Trade 12/3/2010 The Cleaner Air Partnership hosted a discussion about the upcoming California Air Resources Board (ARB) Cap and Trade program at the December 3, 2010 Quarterly Luncheon. Jamie Fine, an Economist with the Environmental Defense Fund, shared Cap-and-Trade 101 with the group. Brieanne Aguila with ARB provided a verbal overview of the ARB Cap-and-Trade proposal followed by Bill Westerfield sharing SMUD’s concerns and focus areas regarding implementation of the cap and trade program. The Cap and Trade program strives to meet the requirements defined by California’s Global Warming Solutions Act (AB 32) to provide a statewide emissions cap, protect and benefit low-income and disadvantaged communities, while minimizing costs and allow flexibility to businesses in how they meet their targets. This program will be considered by the ARB Board at the December 16, 2010 meeting, with a planned implementation date of January 1, 2012. Goods Movement Discussed at Quarterly Luncheon 6/11/2010 Over 45 people participated in a conversation about goods movement in the region at a recent quarterly luncheon held at the West Sacramento City Hall Galleria. Following an overview from Michael Faust of the Sacramento Metro Chamber, the participants heard from Scott Moore, Vice President of Public Affairs with Union Pacific; Tom Scheeler, Port Engineer with the Port of West Sacramento; and Glen Rickelton, Airport Manager for Planning and Environment with the Sacramento County Airport System. Their presentations are available on the Cleaner Air Partnership website. Washington Hears from Air Quality Team on Key Regional Issues 4/29/2010 “When more than 300 leaders from business, government, and the nonprofit sector descend on Washington, D.C. for three intense days of meetings with their representatives each spring, the issues they raise tend to get noticed. That fact was on full display for the 40th Capitol-to-Capitol trip, the largest program of its kind in the United States, hosted by the Sacramento Metro Chamber. The delegation has shrunk a bit since its peak of 400 attendees several years ago, but its impact is no less felt on Capitol Hill. And what was the most valuable aspect of the trip this year for the nine-member Air Quality Team? According to Becky Wood, Environmental Manager for Teichert Materials and a co-chair for Air Quality Team, the trip deepened the bonds of the Cleaner Air Partnership. “By having many members of the Partnership together back in D.C. working on these regional issues it strengthens the Partnership for the work we do all year long. It gives a voice to the reality that public health and good business do go hand in hand and that we can find common ground.” The Air Quality Team took seven issues to Washington, D.C. this year, having vetted them with experts and advocates back home over several months. Issues included (1) encouraging the U.S. EPA to act on our “Regional Exceptional Event” request by May 2010; (2) supporting integrated transportation, economic, and land use models being piloted in our region; (3) maintaining current funding levels for the Congestion Mitigation Air Quality (CMAQ) program; (4) maintaining funding levels for air quality grants for state and local agencies; (5) appropriating $3 million for incentive programs to help retire older wood stoves; (6) supporting state and local flexibility in developing greenhouse gas regulations; and (7) advancing policies that improve waste-to-biomass opportunities on public lands. The Air Quality Team had some 20 meetings in two days involving Senate, House, and Administration leaders and their staff. The results were favorable. “Two of our three meetings with EPA were very well received and provided some great opportunities for future collaboration. It was important for EPA leadership to see the cross level coordination of Cap-to-Cap,” said Larry Greene, Air Pollution Control Officer for the Sacramento Metro Air Quality Management District and a team co-chair. Becky Wood agreed. “The most significant outcome was the bipartisan commitment from our Representatives to help us with our policy issues if we need them to weigh in with the agencies. 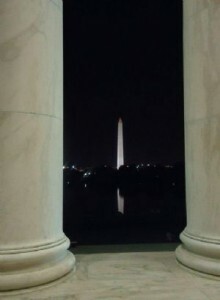 The current partisan nature of Washington was transcended in our meetings with members from both sides of the political spectrum who could see the wisdom of supporting our issues because we had brought together the major parties from the region (regulator, nonprofit, and business) to make improvements for both public health and business,” said Wood. So what’s next? “I think we set the stage for a number of issues that will come up in future legislation on climate change and transportation reauthorization and have good buy-in from our Congressional Representatives for future support on those issues,” Greene concluded. Bill Mueller CEO & Managing Partner, Valley Vision, Inc.
A United States solution will require bipartisan leadership. In his speech at the conference, California Governor Arnold Schwarzenegger reinforced the idea of continuing climate work at the local level stating, “While national governments have been fighting over emission targets, sub-national governments have been adopting their own targets and laws and policies. I would ask the U.N. to convene a climate summit like Copenhagen but for cities, for states, for provinces and for regions.” The conference concluded with general areas of agreement on the topics of reducing emissions, verification, financing and deforestation, leaving implementation details to be resolved at a later time. Wood Burning Rule Amendments Passed Changes to Rule 421 will help improve winter air quality 10/2/2009 The Sacramento Metropolitan Air Quality Management District’s (SMAQMD) Board approved changes to the Sacramento County wood burning regulations (Rule 421) at their meeting on September 24th. This rule restricts burning wood when air pollution levels are predicted to exceed federal health standards during the winter season. The Cleaner Air Partnership supported the amendments to Rule 421, and thanks the SMAQMD Board for taking action to improve our air quality. These changes, which incorporated public and industry feedback, will add approximately 5 additional No Burn days to the 4-month season (on average there are 23 No Burn days per season), while giving residents cleaner air and avoiding 3 more federal health standard exceedances. 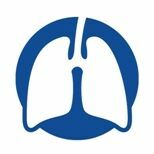 These changes are necessary to improve public health and help our region make progress toward the federal air quality standards during our 3 year review period beginning in 2010, and may avoid the need to adopt other more stringent and costly regulations that could affect homeowners, businesses, and agriculture. We thank all who offered support for these important improvements to our region’s air quality. Results for the 2008 – 2009 Season Check Before You Burn Program Program brings improved public awareness and air quality, falls short of the federal health standard 5/1/2009 The Sacramento Metropolitan Air Quality Management District’s Check Before You Burn program ended its second season on February 28. This regulation prohibits wood burning throughout Sacramento County and its cities including Citrus Heights, Elk Grove, Folsom, Galt, Isleton, Rancho Cordova, and Sacramento from November to February on poor air quality days. 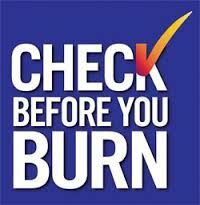 Thanks to partnerships with community groups and local weathercasters, tremendous public awareness and support has been achieved in a short time – 92 percent of those surveyed knew about burning restrictions and up to 52 percent reduced burning when required. These efforts achieved significant air quality benefits – reducing fine particle pollution up to 23 percent, with the greatest benefits in the evening hours. While those reductions are impressive, they’re not enough to achieve the federal health standard. In particular, on days when EPA certified devices and pellet stoves are exempt from burning restrictions the benefits are 13 percent lower, and 84 percent of owners didn’t use the exemption. The AQMD plans to workshop rule changes in July 2009 and seek board approval in September. Landmark Breathe California air quality study now underway 1/29/2009 On January 5, 2009 an important new air quality study began with the placement of 8 DRUM Samplers at five sites along California’s Central Valley, in Redding, Chico, Sacramento, Fresno and Bakersfield. This landmark study, sponsored by Breathe California of Sacramento-Emigrant Trails (BCSET) under the volunteer leadership of Dr. Thomas A. Cahill, PhD, University of California, Davis, will record levels of pollutants along the Valley in 8 size modes, including ultra fine particulates, which, if inhaled, can evade the lung’s defenses to enter the bloodstream, raising the risk of cardiovascular disease and damage to the brain, as well as lung disease. Part of an ongoing effort by BCSET to better understand the nature of particulate air pollution in our region, this pioneer study marks the first research effort ever to simultaneously capture levels of ultrafine particulate pollution along the entire California Central Valley. This study is just the first to take place in 2009. A second study on the health benefits of vegetation appropriately placed adjacent to freeways, will begin at the end of January. For further information contact Kori Titus at (916) 444-5900 or by email at ktitus@sacbreathe.org. Greenhouse law creates long list of decisions Scoping plan underway 2/14/2008 Carrying out California’s landmark greenhouse gas reduction law AB 32 may be a long-term proposition, but important decisions and hearings are popping up seemingly every month about how to get it done. At our September quarterly luncheon, the Cleaner Air Partnership invited Democratic state Assemblyman Dave Jones, Republican Assemblyman Roger Niello and Kevin Kennedy from the California Air Resources Board to update us on the status of AB 32 implementation and chat about issues and opinions surrounding it. 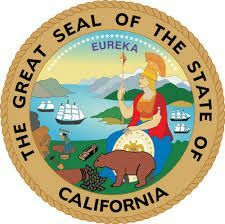 AB 32 mandates that California reduce greenhouse gas emissions to 1990 levels by 2020. Long-term state goals call for reductions far under 1990 levels by 2050. One of the remarkable things about AB 32 is that it touches just about everything in the state economy, Kennedy told us. The air board is developing a scoping plan for measures aimed at larger sources of GHGs, and will begin holding workshops on it this November. This winter CARB is also expected to set the 1990 baseline of greenhouse gases to measure future reductions against, and to set mandatory GHG reporting requirements for some industry sectors, Kennedy said. The air board has already adopted an initial list of early action measures designed to help begin reducing carbon dioxide and other greenhouse gases while the agency works to finalize the core measures at the heart of AB 32. Among the first list of early action measures, Kennedy said, are a new low-carbon fuel standard for autos, restrictions on some refrigerants, and techniques to improve the capture of methane from landfills. 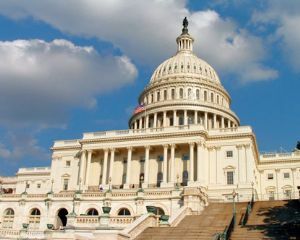 Additions proposed this summer include measures affecting truck efficiency, green ports, consumer spray products, semiconductor manufacturing processes and a push to promote proper auto tire inflation. Kennedy also outlined details and key questions about how his team at CARB will evaluate the possible role of market-based programs such as incentives, subsidies and carbon trading in AB 32. The law does not mandate market programs, but includes them as options. Kennedy said possible benefits could include lower implementation costs, early emission reductions and incentivization of new technology. There is a long list of policy questions to consider in the analysis, Kennedy said, such as how to determine the price of carbon and how to harmonize a California trading system with other states and markets. The agency is studying lessons from similar programs in Europe, Southern California and the Northeastern U.S., he said. Jones said Democrats are concerned there’s not enough funding to research carbon trading in the depth needed considering the problems that emerged in other programs. 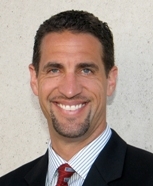 Incorporating land use into AB 32 is also critical, he said. I’m concerned we’re not putting enough time and resources there, he told us. But some believe the state should proceed more carefully in light of contrary opinions and doubts about climate changes causes, Niello said. Overemphasis on prevention could leave few resources for mitigation, he said. We should be moving extremely cautiously, he said. NorCal air quality challenges as diverse as the landscape Bay Area, San Joaquin, Sacramento compare notes 2/13/2008 Northern California air quality advocates and regulators face widely different geographic and political landscapes, but still have plenty of useful lessons to share about cleaning the air. 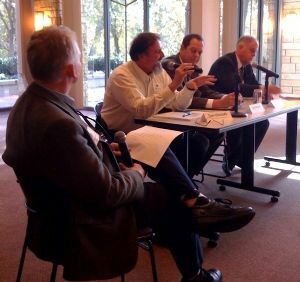 That was a takeaway from our July Cleaner Air Partnership quarterly luncheon, when we invited leaders from air agencies in the San Francisco Bay Area and San Joaquin Valley to discuss their unique challenges, current activities and lessons learned. The San Joaquin Valley Air Pollution Control District is the nation’s largest in area with eight counties and 25,000 square miles, said the district’s Special Projects Administrator Tom Jordan. Yet, it’s home to just three million people. While emissions-per-square-mile there are lower than in the Bay Area, nasty inversion layers trap smog and soot in the valley in both summer and winter, Jordan said. The Valley’s level of nonattainment with federal ozone smog standards is classified as the most severe extreme level. Because of our climate and geography, we have a challenge unmatched by any, Jordan said. That doesn’t mean there isn’t good news. The district has greatly reduced pollution since 1990, Jordan said, and will soon comply with federal standards for large soot or particles. And while the district recently pushed its official target for attainment with ozone smog standards to 2023, many areas of the district will be in compliance much sooner, he said. A key to meeting the ozone smog standards, Jordan said, will come in the form of clean-air incentive programs that help reduce pollution from mobile sources. Vehicle emissions are regulated by state and federal agencies rather than local districts. The district banned residential woodburning on bad-air days to reduce lung-damaging fine soot. 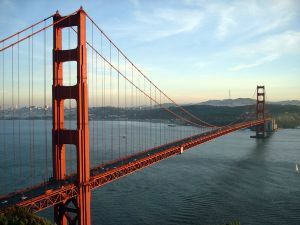 The Bay Area Air Quality Management District will also begin focusing on fine soot because it’s not expected to meet new federal health standards, said the district’s Deputy Air Pollution Control Officer Jean Roggenkamp. Although it has more than twice as many residents as San Joaquin, the Bay Area is only in borderline or marginal nonattainment with federal ozone smog standards, partially a function of temperature and breezes. 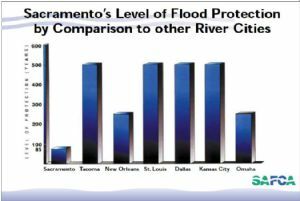 (Sacramento is rated at an in-between serious level). 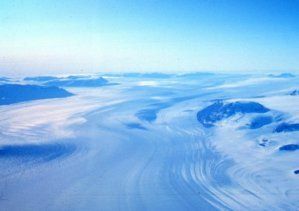 However, rising temperatures and more extreme heat days from climate change could threaten to erode progress, which is one reason why the district launched its own climate change program two years ago, Roggenkamp said. An environmentally aware business community was a help, she said. There will be heat impacts, she said. It’s important to get started now and do what we can. PHOTO BY Rich Niewiroski Jr.
Report: regional blueprint helps fight climate change Study calls Sacramento region’s plan a national model 2/13/2008 A new report on climate change praises the Sacramento region and its award-winning Regional Blueprint Transportation and Land-Use Study as a tool to reduce greenhouse gases. The Urban Land Institute/Smart Growth America report Growing Cooler: The Evidence on Urban Development and Climate Change cites the importance of land use in combating climate change, and cites the Blueprint as a model for local governments. Nearly every city and county in our region endorsed the results of the Blueprint, a voluntary land-use plan created by the Sacramento Area Council of Governments with help from Valley Vision and input from 5,000 citizens. 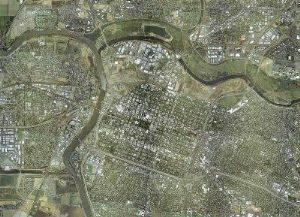 The plan emphasizes infilling vacant or under-used land within existing cities to accommodate population growth, stresses locating jobs closer to homes and envisions more transportation options. If our region heeds its principles, the Blueprint is projected to help lower per-household vehicle miles traveled – a key air quality indicator – below current levels despite 50 percent population growth. Tackling barriers to smart growth together 2/13/2008 Traditionally, cleaning our air has meant reducing pollution from mobile sources like diesel trucks and cars, or stationary sources such as power plants and industry. Over the past few years, a third pollution-fighting strategy has emerged – infilling – housing development within the borders of existing communities, creating less need for car trips and shorter trips when they occur. With a million people expected to move to our region in the next few decades, it’s no small matter. And we’re pleased to be tackling an exciting new project designed to help promote this style of development. Our six-month Infill Barriers Assessment project first seeks to identify barriers to infill development within Sacramento County and the cities within it. We’ll then prioritize the barriers that are suited for local action and develop strategies to help remove those at the top of the list. Finally, we’ll share these strategies and our research with key decision-makers in our region. We’re incorporating the views and opinions of a diverse sampling of more than 20 stakeholder organizations from the public, private, health and environmental sectors. They range from city and county governments and local agencies to builders with infill experience, the building industry association and environmental groups. Our project grew from a request by the North State Building Industry Association and Breathe California of Sacramento-Emigrant Trails to seek and share greater consensus on what is needed to promote infill development in the Sacramento area. The Sacramento Metropolitan Air Quality Management District (SMAQMD) is providing major financial support for the project, which is being coordinated by Valley Vision. Please check back for updates! Encourage employees to sign up for free AirAlert notifications via home email or text messages. Appoint someone to distribute through company email, break rooms or on the P.A. system. Link to www.sparetheair.com on your company home page and Intranet. Offer a work-at-home or ‘telework’ option on Spare the Air days for employees who can complete tasks outside the office. Buy workers lunch on Spare the Air days. Regularly encourage employees to place lunch orders from the same restaurant or store, and send one employee to pick up. Promote carpooling. Sign up at www.sacregion511.org. Join a transportation management assocation (TMA) to for convenient commute options. Provide free or subsidized transit passes for employees.